This is the second QRP Labs newsletter! After the first one, the February 2016 newsletter, I received lots of nice feedback. So I decided to write a newsletter monthly! You'll receive this if you set up a QRP Labs shop account, and if you checked the "Newsletter" option. If you don't like it and you want to unsubscribe please see the note at the bottom of this newsletter. The QRP Labs QLG1 GPS receiver kit was introduced in June 2015 and been an outstanding success. Prior to that we'd re-sold a succession of GPS receivers with onboard patch antenna, starting with the VK16E, then SKM52 and finally SKM61. Each one got better and better. The QLG1 GPS receiver kit gets fantastic feedback, reviews, comments etc. ("It works facedown on my workbench", "works fine in my basement workshop", etc etc.). It's quite simply, the most sensitive GPS receiver in its class, the best that anyone has ever seen! Why? The secret is not just the hot MediaTek chipset, but also the size of the groundplane under the antenna. Because, just like any other antenna, real-estate is key. An over-simplification perhaps, but usually, the more real-estate you throw at your antenna, up to a point, the better it gets! In the case of GPS receivers with patch antennas, the graph (right) shows the patch antenna used in the QLG1 kit (though it can use an external active antenna if you prefer). Up to about 60 x 60mm, the larger groundplane results in more sensitivity - a 7.5dBic improvement in gain relative to a 30 x 30mm groundplane. In reality most integrated receiver/antenna modules are smaller than 30 x 30mm. The QLG1 intentionally places the receiver module right in the middle of a big sea of groundplane (approx 64 x 64mm), and the patch antenna connected to the RF module with the shortest possible copper trace. The vertical red line on the graph is where the QLG1 groundplane size is. Of course the QLG1 has lots of other nice features too! It's a fun, easily built kit, with 5V regulator and 5V logic level conversion for easy integration with 5V systems such as the Ultimate3 QRSS/WSPR transmitter kit. The three onboard LEDs provide visual indication of whats happening, which people find very useful. Anyway I should stop waffling about the QLG1. The reason I am mentioning it, is just to say that the QLG1 has been extremely popular, and now we've just started manufacturing of another batch, before the current batch runs out. There are NO PCB revisions, and NO improvements... because it's just so good already, we really can't think of anything we can do to improve it, or any change we'd like to make! I have a number of new kits in development, but don't like to promise dates etc and then miss them. However two kits are about to start manufacture and should be ready in a month or so, once the component sourcing, packing, documentation etc is done. "ProgRock" stands for "Programmable Rock", a crystal replacement. It's a minimalist controller for the Si5351A Synthesiser kit, intended to produce up to three fixed frequency outputs in the simplest, lowest cost way possible. It's applications would be anywhere you need a fixed frequency oscillator, for example a crystal oscillator, but you can't find that odd crystal frequency. There are three independent outputs so really this is a bank of programmable crystals. The whole frequency range of the Si5351A is available for each of the outputs: 3.5kHz to 200MHz (or up to approximately 300MHz if you don't mind breaking the datasheet spec). You set up the frequencies using a 4-way DIP switch and a button to load them in, which is a bit fiddly but this is intended to be a one-time set up only. Thereafter the frequencies are stored in non-volatile memory (EEPROM) in the ATtiny84 processor. A couple of other neat features are included too. Firstly, you can optionally connect a 1 pulse per second (pps) signal from a GPS receiver such as the QRP Labs QLG1 kit, and the ProgRock will automatically switch the Si5351A's Clk2 output to a divided version of the 27MHz reference, for frequency measurement by the ATtiny84 processor. This is used to correct any calibration or drift in the reference frequency, so that the output frequencies are always accurate (typically a fraction of a Hz across all of HF). Secondly, there may be applications where you want to switch between different sets of output frequencies, such as band-changing of a receiver. ProgRock contains 8 banks of three output frequencies. The active "bank" is selected via 3 input signals to the processor. This is a range of band pass ifilters (BPF) for receiver input filtering purposes, with a kit version available for each HF band. The BPF is a double-tuned resonator circuit, and fits on a PCB the same size and style as the existing popular QRP Labs Low Pass transmitter output filter kits, 1.5 x 0.5 inches (38 x 13mm). Each PCB has two toroidal inductors in parallel with capacitors, to make the two resonant circuits, and a small coupling capacitor between them. Each resonant circuit also contains a trimmer capacitor for tuning. There are lots of ways to design BPFs but I find this one is always reliable and easy to adjust. QRP Labs constructors come in all shapes and sizes (I mean, different abilities, different equipment, different expectations, etc); and it's important to have a filter topology which "just works", without fuss, and without needing expensive equipment or extensive skill to adjust. I have always found the double-tuned resonator filter works very well. Last year Dave VE3KCL launched six high altitude, long distance super-pressure balloon flights (a.k.a. party balloons), using the Ultimate3S for HF tracking. A special firmware version of the U3S was developed, which re-purposes WSPR messages to carry additional data telemetry, containing altitude, 5th and 6th Maidenhead locator characters, ground speed, temperature, battery voltage, and GPS/satellite status. Dave installed this firmware on an Arduino Nano, which uses the same ATmega328 processor as the U3S. Other components in the tracking payload are QRP Labs Si5351A Synth kit as transmitter, GPS receiver module, LiPo battery, and charge controller. Dave's six flights are extensively documented here http://qrp-labs.com/ultimate3/ve3kcl-balloons.html. Flight S-4 (right) was the most successful, it flew for 6 days, from Canada crossing the Atlantic and many European countries at an altitude of around 8,000m, covering a total distance of over 10,000km before landing in the Norwegian sea in bad weather. 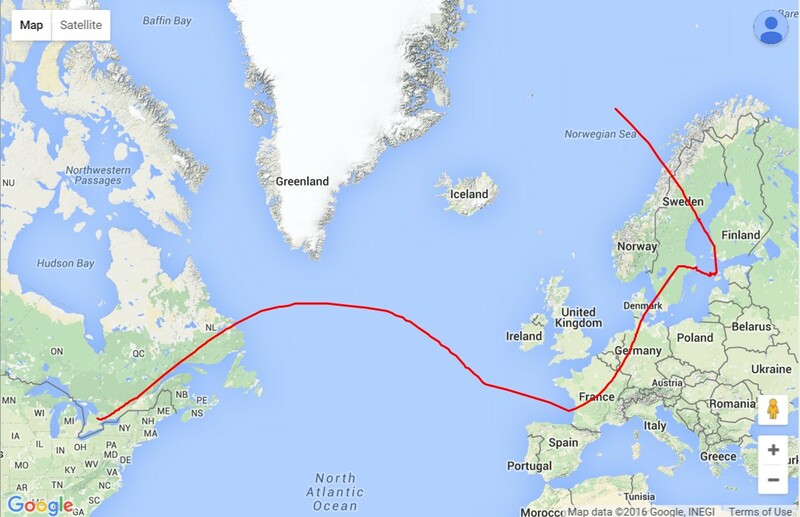 During the flight the best DX from the 16mW transmitter was copy in New Zealand by long path, a distance of 22,000km! Anyway, Dave's been working on many aspects of ballooning over the winter, and is now ready for some more balloon flights. S-7 is ready for launch imminently, just awaiting wind directions to be suitable. For this "experimental" flight, Dave made a number of changes, including re-design of the module layout in the insulation foam, changes to the power supply voltage and charging arrangements, pre-stretching the balloon envelope, and higher gas pressure in the balloon. Several changes are being tested at the same time so it will be interesting to see how the flight goes! As previously, we'll have live tracking on http://qrp-labs.com/ultimate3/ve3kcl-balloons.html once the balloon is up. Watch social media for the launch announcement (see below). "The VK0EK 2016 Heard Island Expedition will carry a 250-milliwatt Ultimate 3S battery-powered beacon assembled by supporter Richard AB4ZT. We will transmit on 40-30-20-15-10 meters using a Hustler 4BVT vertical throughout the expedition." "The beacon will be deployed in Cape Town ~3/3-3/10 as ZS/K2ARB, on the voyage aboard the R/V Braveheart ~3/10-3/21 as K2ARB/M, on Heard Island 3/21-4/12 as VK0EK, back on the Braveheart from ~4/12-4/22 and finally ~4/22-24 in Perth as VK/K2ARB. Given that we will be thousands of miles from the nearest amateur stations, it will hard to miss us on the map! Please turn your antennas our way!" The Heard Island expedition website is http://vk0ek.org/ and in case, as I was, you are wondering where on Earth Heard Island is anyway... this is the Wikipedia page explains it all. Briefly, it's somewhere in the Antarctic, population zero, very far from anywhere, and it sounds pretty cold. The QRP Labs Arduino shield has a BS170 Power Amplifier just like the Ultimate3S kit. It has sockets for adding an LPF kit, an Si5351A Synth kit, and even a relay-switched LPF kit. It has a 4-pin header that matches the QLG1 GPS kit. Quite a lot of these have been shipped out, but it would be very interesting to hear a bit more about what people are using them for, and why not share your sketches with others, too! So if you have one of these shields and have used it for something interesting, please email and let me know! It would be great to be able to publish some more example sketches and other details of practical projects. QRP Labs has the following presence on social media. If you use these social media then please join or follow QRP Labs! Announcements such as new kits, or VE3KCL balloon launches, will be made in these media. Earlier this month, I finally realised (and finally got tired of) the fact that I spend quite a lot of time repeating myself, giving the same old answers to the same old questions. I created a FAQ page http://qrp-labs.com/faq.html in the hope that people might find an answer to their question without having to email me, and even if they do email me, at least I'll just be able to direct them to the relevant part of the FAQ. As time goes I'll add more stuff to this page. I wish I had an unsubscribe link for you to click, but I don't. If there is a way to do it in this system, I don't know it. So if you want to unsubscribe, then the only two ways to do it at the moment are: either log in to your QRP Labs shop account and un-check your newsletter preference, OR, email me and I'll try and do it for you. As always, please do write with any comments, ideas, criticism, feedback of any kind!